Heat oven to 350 degrees. Bring a large pot of salted water to a boil over high heat. Add macaroni and cook until slightly tender, approximately 10 to 12 minutes. Drain and rinse with cold water. Set aside. In a large bowl, beat eggs with milk, 1/4 cup melted butter, cayenne pepper, and a teaspoon of salt. Chop cooked lobster into 1-inch pieces. Combine lobster in a bowl with Cheddar, mozzarella, and Monterrey Jack cheeses. Put half macaroni into a buttered 2-quart casserole dish. Add half lobster and cheese mixture. 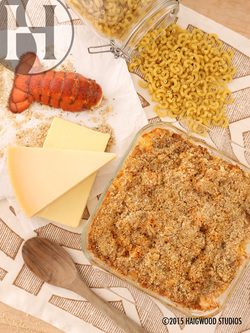 Repeat with remaining macaroni and remaining lobster and cheese mixture. Pour milk mixture over top. In a small bowl, combine Parmesan, bread crumbs, paprika, and remaining melted butter. Sprinkle over top of macaroni, covering entire surface. Bake for 45 to 55 minutes until brown and bubbly. Serve warm.